What is a carrier? Can I ever get rid of MRSA? Will I always be a carrier of MRSA? Staph and MRSA bacteria commonly live in the nose of carriers. MRSA is a growing problem across the world, often causing painful skin boils and abscesses, but also internal infections like pneumonia. Everyone is exposed to these contagious bacteria more often than they realize, but yet not everyone who is exposed gets infected. For some, MRSA simply lives inside their nose and on their skin and it doesn’t cause any symptoms or infection. These people are called “MRSA carriers“. Carriers may never get infected. However, carriers can spread MRSA to other people who may become infected. Continue reading for commonly asked questions, plus facts about this disease even most doctors don’t know. Some people are a Staph infection carrier. MRSA is an antibiotic resistant type of Staph bacteria. 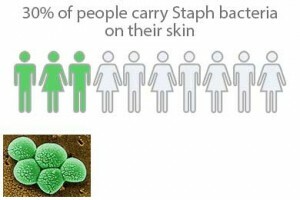 Staph is typically easier to treat as it causes a less dangerous infection. What is a carrier? Carriers have living MRSA bacteria on or inside their bodies. Roughly 30% of people carry Staph bacteria (and an estimated 1-5% carry MRSA) on their skin and/or inside their nose or throat and don’t even know it. They may never get infected and often have no idea they carry it. These people are called “carriers”. Your doctor may have said you are “colonized” with the bacteria. MRSA colonization is the same as being a carrier. People who harbor MRSA can spread or transmit the bacteria to others. It’s possible for them to spread it to someone else who then becomes infected. If You are a carrier, will you get an infection? Not necessarily. Just because you carry the bacteria on your skin or in your nose, it does not mean you will get infected. However, your risk of becoming infected is greater if you are a carrier than those who are not. There are many risk factors that can increase your chances of an infection, such as puncturing your skin or having surgery, but it does not guarantee you will get infected. Some factors that increase your risk of infection include your age, medical conditions (like diabetes), stress, amount and route of exposure, a history of infections, and a weakened immune system. If you are a carrier, do you have an increased chance of getting MRSA? Yes. According to a study published in Clinical Infectious Diseases1, being a MRSA carrier increases your risk of both infection and death. They found that almost 25% of people who carried MRSA for more than one year developed infections. 84% of subsequent infections required hospitalization and a few infections resulted in death. The study authors warned this data may not be representative of carriers in general since they were studying medical center patients. Another study shows that people who are persistent carriers have increased chances for infection and death2. Because some MRSA infections can be very dangerous, and some people are at greater risk (elderly, young, and immune compromised) a lot of emphasis is placed upon decolonization procedures, or ways to remove the bacteria from your body. Read on below for prevention and treatment methods. If You’re a carrier, can you infect someone else? Yes, you can spread the bacteria to other people, and those people can get infected. However, they may not get infected, and they may not carry the bacteria. As mentioned above, many risk factors come into play besides exposure to the bacteria alone. Medical professionals often downplay the risks of being a carrier or being around carriers. However, carriers of MRSA can spread the disease to others. And MRSA carriers have been documented to spread the bacteria into the air. A Leeds University study3 highlighted the potential risk of catching MRSA in a hospital. This 2001 study highlighted that people who were either infected or who were simply colonized can spread the bacteria into the air, creating a risk for others around them. Only a test can tell if you carry the bacteria or not. How do you know if you carry MRSA? The standard testing method is a bacterial culture test of the nose. This means the inside of the nose is swabbed, and the lab determines if MRSA is present. If a person carries the disease, the nose is one of the most common places to find the bacteria. A positive nose culture test means that you carry the bacteria. However, if your nose culture test is negative, you may still be a carrier. This is because carriers can have the bacteria living in other parts of their bodies and still test negative at their noses. Some doctors believe that the back of the throat is a more accurate place to test. The bacteria prefer places that are warm and moist, including the nose, throat, armpits and the groin area. In fact, some doctors will also test the throat and groin area in addition to the nose. What are the symptoms of being a MRSA carrier? Carriers who are not infected do not have infection symptoms. Signs of infection can include an infection that looks like a bug or spider bite, skin bumps, pimples, boils and abscesses. Internal infections are more commonly seen with hospital visits and can be pneumonia, septicemia or catheter infections. Click here for symptoms to watch for. How do you become a carrier? What are the risk factors? You can easily pick up the bacteria by being close to infected people, which is most common in hospitals, nursing homes and in other healthcare facilities. Family members can also become carriers (or get infected) by caring for their children or parents who are infected. MRSA bacteria are commonly transferred from surfaces and objects that are contaminated with the bacteria (like phones, door knobs, toys, etc) to your skin. You can also become a carrier after having an infection. It can also pass through the air on dust and other particulates. Discover “The Top 5 Mistakes” that waste your time and delay your recovery. Michelle is committed to protecting your privacy. She will NEVER rent, sell, or misuse your information. Will you always be a carrier? Possibly. Many people have stopped carrying the bacteria. People who were both infected and carried the bacteria have since tested negative on their nose cultures for the bacteria. Michelle Moore has seen this happen for people using either antibiotics or natural treatment methods. However, MRSA and Staph can be very difficult to get rid of. A powerful factor is that these bacteria can create biofilm colonies and L-form “stealth bacteria” to hide and protect themselves inside your body. Many antibiotics do not work against these stealth bacteria and that’s where non-antibiotic approaches come in. Many people have found taking maintenance levels of natural antimicrobial agents like oregano essential oils and olive leaf herbal supplements to be very helpful. Products that break down biofilm layers in the body can be beneficial and can also help your antibiotics to work better, such as Manuka honey. Strengthening your immune system is also an important factor. How can you decolonize from MRSA? Current conventional MRSA decolonization strategies include using the antibiotic cream mupirocin and swabbing inside the nose with it. Antibacterial body washing using chlorhexidine soap is also recommended and sometimes oral antibiotics are used. A study published in the Infection Control and Hospital Epidemiology Journal4 concluded a successful decolonization protocol using a treatment consisting of: mupirocin nasal antibiotic, chlorhexidine mouthwash and a daily body wash using chlorhexidine soap. Intestinal, urinary and vaginal colonization, if present, was also treated at the same time and oral antibiotics were added if this treatment regimen failed. Antibiotics have the side effect of killing the good bacteria that help to protect and support your health. Because of this and other side effects, Michelle favors methods that work with the body and minimize antibiotic side effects. 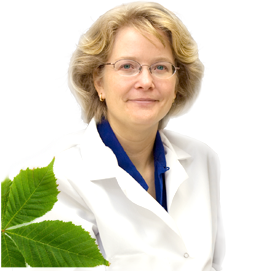 She has seen complementary treatments, such as swabbing the nose using essential oils, and supporting the immune system help people clear MRSA bacteria from their nose. A simple solution may also be provided by Vitamin D. A study in the Scandinavian Journal of Infectious Disease5 showed an increased risk of MRSA nasal colonization with low vitamin D levels. Vitamin D works in many ways to support your immunity, one of which is helping the skin create antibacterial agents. Most people are very deficient in this important immune supporting vitamin. Can you totally remove MRSA from your body? Michelle has heard that many people no longer test positive after having been infected. However, she does not believe that a “total elimination” mind set is always appropriate. Such a mind set can lead to a paranoia of sorts. And a person may be exposed again to the disease in the community or in a healthcare setting. A better goal is to restore balance to the protective bacteria inside your gut and on your skin and restore the health of your body’s natural defenses. Because of the superbug bacteria present everywhere today, it’s important to make your body more resistant to these bacteria. Resisting infection can be much easier if your immune system is strong and your body is in balance. The best way to guard against infection is to use a multi-front approach. While good hand and body hygiene, using treatments that work, and cleaning your home are all important, those who make their body naturally resistant to infections see the best results. If you are a carrier or if you have an active infection, learn how to use treatments that support your body without tearing it down. If you’ve been infected in the past, then boosting and maintaining your natural resistance is one of the most effective things you can do. 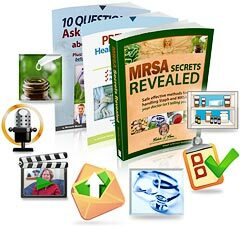 You can learn about the most important steps to stop MRSA here. How contagious is MRSA and Staph? And how does MRSA spread?